1 What makes a great goalkeeper? 2 What are the best goalkeeper training drills? It’s no surprise that the most successful teams in the world have been based on having a rock solid defensive line, and today we’re going to look at the best soccer goalkeeping drills to ensure that your team lead from the back. Think of some of the great teams through history such as Arsenal’s Invisibles or some of the great German teams of recent years and what do they have in common? A water tight defense orchestrated by a ruthless goalkeeper who would let nothing past him. Whilst goal keeping in itself is an individual art form, it can be broken down into a number of core elements, which like anything you can improve through training drills and discipline. The ability to move around the penalty box and particularly within the 6 yard box requires a really dextrous and flexible body. This will really help with reactions and the ability to reach almost impossible shots. You’ll often find that the really great goalkeepers have been practicing yoga as part of their fitness regime. Whilst some keepers are great shot-stoppers, the best keepers are the ones who are ordering their defenders around the box. A goalie is going to have a great perspective and view of the game unfolding and should be a commanding presence at the back, who is fully in control of the defense ahead of him. Now you might not think that goalkeepers are the sharpest tools in the toolbox, but in order to command your penalty area you need to have a great understanding of the game and a high level of intelligence and awareness. This will help with your decision, making process for example when you should go for a cross or when you should stay on your line, should you go to ground, when to come outside of your box etc. All of these decisions can be really costly so developing an understanding of how the game will play out is critical. What are the best goalkeeper training drills? OK, so if you have a look on the internet then you are going to come across hundreds and hundreds of videos for goalie training. Some good, some bad and some ugly! The good news is that I’ve already trawled through most of these videos and have managed to pick the best from the best to save you that effort. Having nimble feet is a crucial skill for all goalies to develop as it helps to keep them in position as the play develops in front of them and will also help with shot stopping and extending to the maximum reach. Watch any great goalkeeper and you’ll notice how smoothly they move across their goal line. Watch any major blooper that a goalie has made and you’ll usually find that it is down to their poor footwork. A step out of time or in the wrong direction can prove costly when you’re the last line of defense. Watch this simple set of drills where the keeper focuses on short, precise steps between the cones, keeping on his toes and ready for action. Watch how the pro's do it in this video. Key takeway from me in this video is the speed of the goalie's feet in these drills, which means he covers distances quickly, but remains balanced and in control. I like the drills featured in this video as well, as they gradually build up the distance the keeper is making around the box and finishes each drill with a dive. This final set of exercises that I have picked out focuses on your shuffling technique followed by a good collection and handling technique. Having great footwork will get you in the right position, but the next most important thing is to be able to spring from that standing / crouching position into a dive to give you as much coverage of your goal as possible. In this next series of drills we look at techniques and exercises to help you improve your overall diving ability. This video does a great job of breaking down the basic diving technique to give you step by step tips as well as a number of drills to practice low, high and weak side dives. Whilst it is aimed at beginners it's also a good refresher for all keepers to go back to the basics! These drills continue with the theme of good footwork and shuffling to get you into position, followed by a low ground dive. Saving a shot bound for the top corner of the net is the most challenging but also the most rewarding of saves for a goalkeeper. In this drill we watch a simple training session from Bayern Munich where they keepers are fed balls to the top corner of each net. Watch how much spring they generate to reach these balls. This final video is a good example of a training session that you can use with your goalie to practice all different types of dives. This will be both a good strength workout, but will also improve the goalkeepers agility and reaction times. Another skill that the best goalkeepers in the world will have is the ability to react quickly and save shots from close range. ​When you think of a classy keeper like David de Gea, you'll immediately think about his reaction times and his unworldly ability to save impossible shots from close range at speed. ​These kind of keepers don't just have great reactions by luck, but this comes from hours and hours on the training field practicing and improving these skills. Some really nice drills are featured in this video to help your keeper quickly react to different situations. As I said, developing great reaction takes time and in this video you can see how the professional soccer players at Deportivo de La Coruña improve their skills. In Futsal more than anywhere else is reaction time critical for a goalkeeper as close shots will be coming in from all angles at speed and your keeper will need to be on the top of their game to stop them. Check out this video to see how England's goalkeeper trains his shot stopping and reaction skills. Your goalkeeper can have the best positioning and agility in the world, however, if he doesn't have a safe pair of hands then it's pretty pointless. There is nothing worse in the game than seeing the ball hit to your goalkeeper for it to slip through his hands into the back of the net. Simple tips and drills for beginner goalkeepers to improve their handling skills. This is a quick-fire drill to focus on catching and releasing the ball quickly. A full range of drills for your goalies to take into your training sessions and perfect their handling. Next we're going to look at developing the skills to dominate your box and practice collecting the high ball. A great goalkeeper knows when they should come for a cross and when they should stay on their line, but if they do commit to taking the high ball they'll need to do this with confidence and security, otherwise they leave a gaping hole in the goal behind them. This video is great for beginners as it takes you through the basic technique for jumping to claim high balls, looks at leg postion, strength in the air and the importance of shouting 'Keeper' when you go to collect the ball. If your soccer club has enough money then I would seriously suggest you invest in this piece of kit. Use this rebounder to practice taking high balls on your own and you'll master this skill in no time! If you're just in need of some basic drills to practice high balls with your goalkeepr then I'd recommend these 8 basic drills below. Finally I've selected this video, which gives you a routine of stretches and exercises to help you improve your jumping ability, so you can reach above others for those high balls. The last set of drills that we are going to look at today are designed to help your goalkeeper's distribution and passing of the ball to outfield players. The ability to accurately find a team mate from a goal kick, or quickly releasing the ball to turn defense into attack is an underrated skill that all keepers should work on. Too often you will find that goalkeepers can get lazy and just blast the soccer ball up field​ when they should really be targetting individual players and looking at how they can build the attack from their initial pass. These first 2 videos will help you to improve the accuracy of your passing, both directly out to the full backs but also practicing your longer range passing to midfields and up to the strikers. Having quick feet and a delicate touch is vital for keepers to develop. Often the ball will be played back to you at pace, with a striker chasing the ball down, so you need to be able to quickly control the ball and release a simple pass to a team mate to avert any danger. Building on from the one touch drills you also need to work on receiving a back pass and playing this out. Watch this video for some simple tips on how to approach a back pass from a defender. We all know that being a goalkeeper can be a pretty lonely occupation sometimes and it may also not be easy to find other people to train with you and throw and kick soccer balls at you all afternoon. Well, don't worry, there are still a number of drills that you can practice on your own that will really help you develop your overall game, without having to depend on anyone else. 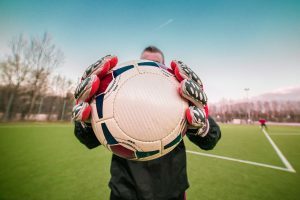 ​Being a professional soccer goalkeeper in the modern game means that you need to have many different strings to your bow, as we have demonstrated with this wide variety of drills today. A great goalkeeper really is an allrounder as there are so many aspects to goalkeeping that you will need to perfect. My advice for beginners is to start with the basics and focus on footwork and technique to start with, then gradually build up your strength and reactions using the goalkeeper training drills that we have been through today. Yes, for sure a soccer rebounder is an excellent piece of kit for any keeper. Great for practicing all the different angles and directions to catch the ball!